Last week LifeJourney’s Director of Education and Engagement, Renee Hoareau, presented the Day of STEM initiative at the 2018 ATSIMA conference. The 2018 conference organised by the Aboriginal & Torres Strait Islander Mathematics Alliance (ATSIMA) was themed ‘Starting the Revolution – Transforming Mathematics Education’ and was hosted by RMIT University in Melbourne. It was rewarding to be involved in reciprocal learning about STEM education through an Indigenous and Technology lens. The immense importance of STEM in Indigenous history and culture connects strongly to community and country. The audience saw the opportunity for all students and teachers, through the Day of STEM particularly those in remote locations, to learn about STEM skills enabled by technology for emerging careers of the future. Jade Kennedy’s ‘Indigenising STEM Curriculum’ keynote highlighted the STEM Camp offered by CSIRO to a number of Indigenous students. This education project aims at increasing participation and achievement of Aboriginal and Torres Strait Islander students in STEM. Students learn about their culture and connectedness to country. First tasks involve students learning without technology, ‘old ways’ with later activities using emerging technologies to resolve problems, observing the synergies of a variety of methodologies. Student voice resonated with the conference community. Primary and secondary students presented confidently about their experiences in STEM and the role they play as mentors and advocates of the value of mathematics for learning and STEM careers pathways. 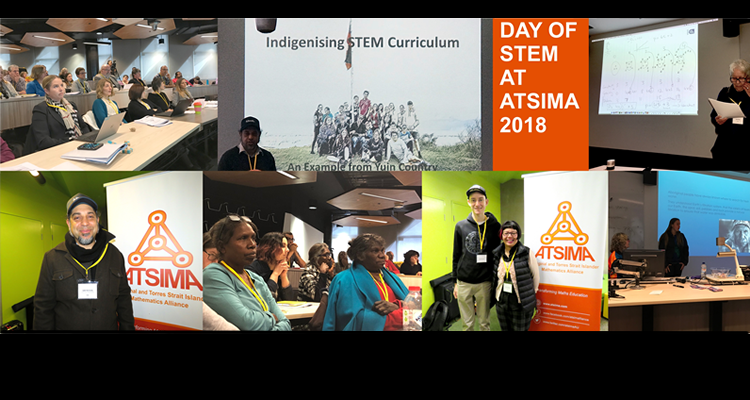 ATSIMA and Day of STEM are education partners working together to provide STEM career information for Indigenous students.